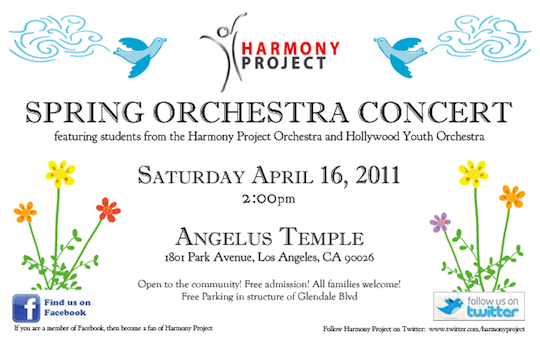 The Harmony Project will hold a Spring Orchestra Concert featuring live music by students from their organization and the Hollywood Youth Orchestra on Saturday, April 16. The concert begins at 2:00 p.m. at Angelus Temple, 1801 Park Avenue, in Echo Park. Free parking is available in the Angelus Temple parking structure off of Glendale Boulevard. It's free and open to the public. The Harmony Project is a local nonprofit organization that works to promote positive youth development through year-round music lessons and ensemble participation for at-risk youth in underserved areas of Los Angeles.